The cover shows a shamanic dreamcatcher that depicts the "Ghost Hunt" theme of this episode. 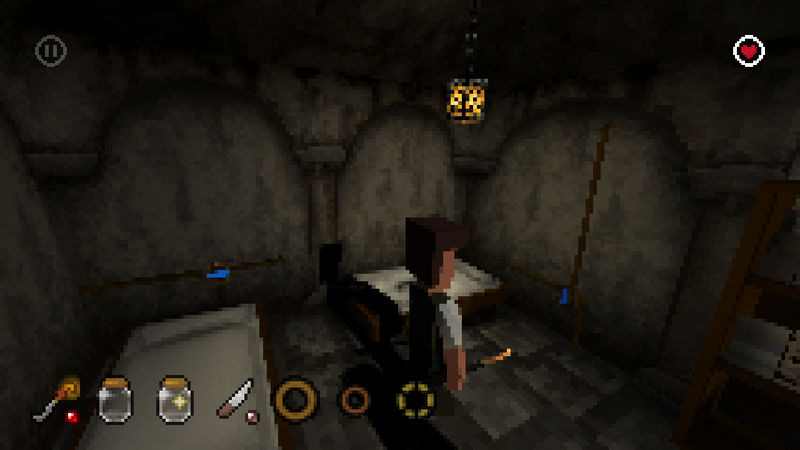 The visual similarity to the cage in which the player awoke in episode 1 gives an indication that the player himself was caught as a ghost creature. Blue-violet shining stones in the web match the color of the monsters emerging in this episode. The web itself as well as eight stones, which are arranged around a larger one, resemble the anatomical characteristics of a spider. You entered the living room and find the fainted woman as well as a cocoon surrounded by monstrous spiders. There are several ways of solving this level that will affect later episodes. In addition, you can use inventory objects multiple times for different purposes. Look at the woman on the floor. Keep looking around and look at the window, the animal skulls and the knocked-out furniture and the front door. Take a glass from the cupboard at the back left. Walk to the front and look at the bucket beside the unconscious woman. Fill the glass with water. Wake the woman by providing the glass of water. The woman can be awakened before or after the fight, which leads to slightly different dialogues. If she awakes before fighting she will encourage you to kill the spiders. When talking to her several times she even gives an hint of the most effective method. The spiders stay calm as long as you don't come too close. It is possible to move in the back of the room without triggering spiders. If you are within reach of a spider, you can attack it, but it will also attack you. The fight against the spiders can be won with the right strategy relatively easily. The character should be equipped with a strong weapon and stand within the range of a spider. As soon as multiple spiders attack simultaneously, the battle is much more difficult to pass. Current life energy is represented by a heart in the upper right corner of the screen. To prevent the life force from being exhausted by many spider bites, water can also be drunk to refill health. Go to the chimney and move as far as possible in the back of the room to avoid a spider attack. Take the poker that stands at the fireplace and look at it. Strokes with the poker are more effective than fist fight. Drop the poker on the chimney fire so that it gets a glowing tip and look at it. This weapon has the most power for fighting. Take a glass from the back of the cupboard and look at it. Purple-blue sparkle covers the cocoon which fades when you kill spiders. This visualizes the connection between the ghostly creatures and the murder of Harry. The spiders glow in blue-violet, the key color of all hauntings which appear in several places. This is a visual indication that they are conjurations of Sam, that is, helper beings that he has infiltrated into Chris' consciousness. Similar to hunting dogs, they are meant to help Sam capture the scattered soul fragments that appear to Chris as persons like the hermits. Kill spiders one by one. Walk close to them and hit them with the glowing poker. Use the sequence shown in the image to prevent you from being attacked and killed by many spiders. Find the numbered spider and stand on the indicated foot position for fighting. If health is low drink a glass of water by dragging it onto the character. You can refill the glass at the bucket anytime. Talk to the woman who will ask for her husband. Go to the cocoon and look at it. Click on the cocoon to rip it. Look at the crack that appeared. Now you need an empty glass. You can take one off the shelf or drink a glass filled with water or pour it back into the bucket. It is not possible to wear more than one empty glass. But you can wear an empty and a full glass at the same time. Go to the window and look at the butterfly in the lower right corner. Catch the butterfly with the jar and look at it. The butterfly is not required to finish the game, but useful in Episode 5. Go to the woman and talk to her. You can talk to the woman a second time and tell her you're going first for security reasons. Click on the front door and leave the house together with the woman, Barbara. It appears that an attack was apparently taking place at the village. All the houses are abandoned, some are on fire. In addition, the village is teeming with spiders. After a dialog about the devastation exploration of the village begins. Walk back/up to village square. Look at the pedestal of the statue. Barbara says that there was a statue of the village founder on the pedestal. As it turns out later, it's a portrait of Chris. As we find ourselves in his imagination, he is literally the creator of the village. However, because he is currently repressing this knowledge, the statue has disappeared. Look at the house on the far right, it is at risk of collapse. Look at the house with spiders on the roof. Enter this house with the spiders through the front door. First, look around and see the boxes hanging under the ceiling, the ropes on the wall, the middle rope on the wall, and the table and boxes on the floor. Go to the cupboard and click on it to get a knife. Drop the knife on the middle rope to cut it. The box above the spider is loosened and the spider is struck. Read the letter on the cabinet. The text concludes that the letter is addressed to a Mr. Pioneer who works as a ghost hunter. (Details on that are revealed by the business card's text later.) For the player who has come to this place as a stranger, it may appear that he/she is the ghost hunter Sam who was called to help. The letter doesn't really exist, it's another fragment in Chris' imagination, a subconscious reminder that he wants and expects Sam's help. This also explains the apparent contradiction that a Ghost Hunter is present, even though the letter was apparently never sent. Click on the cabinet to get the left part of a business card. The knife can be used as a weapon. Only if you have not taken the poker from the house of the hermits, there is another iron poker in the side street near the collapsed house. By dragging and dropping one of these two weapons onto the character, weapons can be changed. The knife is slightly weaker than the poker. Leave the camera setting down so you can see the fountain as well as the two burning houses. Look at the well. If your life energy is low, click it when the heart-shaped mouse pointer appears to reload health. Look at the fire, which beats from the roofs of the houses as well as the red windows of the house on the right side of the screen. Fight the spider that sits between the two burning houses and walk through the freed way backwards. Walk around the house and read the book lying on the bench. Depending on the interaction with Barbara, the further course of action branches out. Both the end of episode 2 and later events in the following episodes will vary depending on your behavior. What matters is whether Barbara fights freely or whether she remains in her submissive role. Pickup: This step was already met when Barbara was escorted from the house to the village. Motivation: Click on Barbara and choose topic "Fight!". Exercise with tools: Equip Barbara with a weapon by dropping poker or knife on her. Gain experience: Make sure that you do not kill all enemies, but that Barbara fights as much as possible. The difficulty lies in placing yourself next to an enemy so that Barbara is in attack, but you are not attacked too much. Barbara begins to fight as soon as the dialogue "fights!" has been executed. She also fights without a weapon, but then it takes a longer time for her to gain enough experience that is required for establish her self-confidence. It is possible to fight together with Barbara. However, you should be aware that you can gain enough experience. As soon as Barbara has gained a new level of self-confidence, she will share her new insights. A total of three stages of emancipation are possible. At least level 2 must be achieved so that Barbara is confident enough to assert herself towards Valerian. If Barbara is not asked to fight, she will not gain self-confidence. The same applies if she cannot collect enough combat experience. Orientation: We are still in the camera angle in the back of the village, at the burning house with the bench infront of it where you found the book. Look at the burning door. Continue walking around the house to the crossing. Look at the house on the left side, it seems strangely intact. Go further to the left until you reach the door of the intact house. Take the right part of a business card from the floor. Only if you are not currently wearing an empty jar in your inventory, you can take one now from the box at the left side of the room. Click on the ceiling of the room to view the house. The character notices that the house looks like a backdrop, an indication that it is a constructed dream world. Walk back to the crossing. Talk to Barbara about the spiders, the inhabitants and brother Valerian. Fight the spiders on the way (possibly with the help of Barbara) and walk up to the rock formation. Look at the big rock. Talk to Barbara about the rock shrine. Follow the path up to the bull totem. Talk to him to see that he's blocking the way for every stranger. Talk to Barbara about the bull. This "bridge troll" is one of Sam's guards he summoned to cut off Chris' way. Sam tries to find straying Chris more easily through this encirclement. 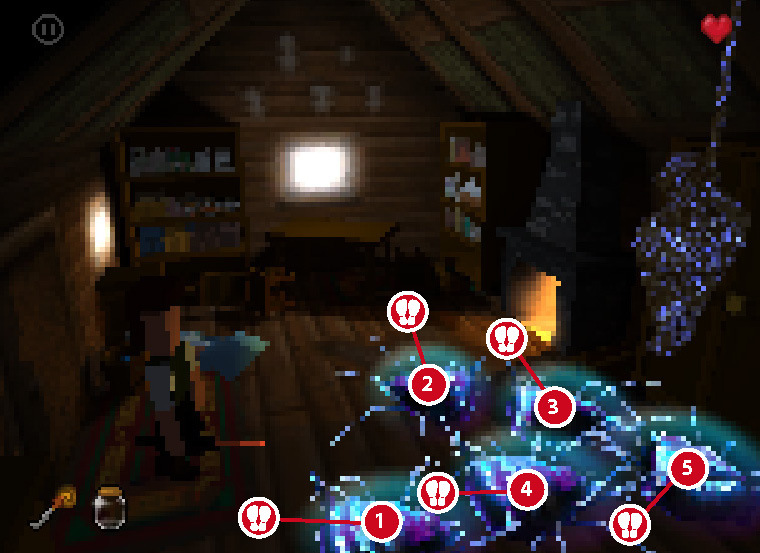 From view of game design, this blockade is important to ensure that the player has found the business card and that the Ghost Hunt has been communicated as an essential story element. Look at the individual parts of the business card. You can also talk to Barbara about these items by dragging them onto her. Combine the two separate parts into one business card. Look at the business card. In the German localization acronym of the Ghost Hunter Company "Parapsychologische Schädlingsbekämpfer International" (parapsychological pest fighters international) is PSI which corresponds to the Greek letter ψ. This in turn is the name giver of "PSI phenomena", which describe supernatural abilities and phenomena. The term 'pest' is ambiguous here, but it also seems to fit the spiders, which are actually not meant since they are summons of Sam and not the ghosts to catch. On the business card a fictitious postal address is given which encodes the coordinates 50°13'32.8"N 125°14'44.3"W. It points to Quadra Island, a Canadian Island inhabited by native people. This creates a hidden reference to Sam's Indian roots. Show Barbara the business card. She now introduces her name and assumes that you are Sam. Barbara knows it's not Sam, but she's playing to keep Chris locked in the fantasy world, which keeps herself alive (because she is a mental manifestation). Only when she has seen the business card and has acquired self-confidence, she calls you "Sam" at the end of the episode. Otherwise, she simply calls you "stranger". Give the business card to the bull totem which will be banished. Go upwards into the convent. You can walk both across the courtyard and along the covered aisle. Look at the thorns and the table above the door, which shows the way to the village. Talk to Barbara about Valerian. Go downwards and look at the well shaft, the bucket, the gutters in the ground as well as the gargoyles in the upper corners of the courtyard. Leave the courtyard downwards and look at the bell in the bell tower and the stone slab with the bell symbol. Try to open the door to the bell tower. Exit to right to the door with the damaged masonry. All around the entrance to the prayer room radiating cracks in the masonry can be seen. Like an explosive lightning strike, they symbolize the enormous power of faith. Look at the symbol board above the door. Lift the mineral stone that lies at the archway. Enter the prayer room through the door. Talk to Barbara about the Spiders. Show the mineral stone to Barbara. Enter the library through the back door. It is advisable to save at this point at the latest, as the library demon can cause a sudden death. Walk into the room to the table and look at the demon. He keeps a book. Look at the chess board on the table. There are only the two kings on the board. Be careful not to get too close to the demon. Otherwise it turns into a deadly cyclone. If he turned into vortex, you can escape if you walk out of the room quickly. Upon re-entering, the demon calmed down again. Just like the bull the chess demon is of one of Sam's guardians to block Chris's way. Easter Egg: The design of the deadly Cyclone is a tribute to Alone in the Dark 1, where a similar vortex appears. Talk to Barbara about the demon. Walk back to the shelf wall next to the front door and read the red book on the top shelf. The text gives an indication that the demon can be beaten with the tower. Destruction and rebuilding are central motifs of this episode: Barbara has to give up her old life to find herself anew. The task of the Ghost Hunter is to hunt and destroy ghost beings. A butterfly is born from the death of characters, who, in turn, can be caught (like ghost hunter catches spirits). And the self-scourging brother Valerian is in a constant struggle between self-destruction and search for peace. In Tarot decks, the card "The Tower" stands for collapse, change and leaving old ways. This symbolism is reflected in the fragile walls of the monastery, crowned by the bell tower, the highest point of the entire scenery in Episode 2. The whole storyline is focused on this central point where episode's finale will happen. The fact that the chess demon can be beaten with a tower transports two meanings: On one hand, the tower object impresses its own function as the key to access the monastery's tower. On the other hand, the tower stands for the destruction of the demon and the opening of new possibilites and paths to explore. Walk around the middle shelf to the back bookshelves. Lift the large ring located at the back end of the shelf. Read the book on Pest Control by using mineral dust. Walk back to the monastery courtyard. Walk down, straight across the yard until you reach the opposite wall. Look at the sign with the fire symbol. Go through the door into the kitchen. Look at the table, the chopping block behind the door, the side cupboard, the fireplace, the large cupboards on the window wall. Look at the coffee grinder on the table under the window twice. Grind the mineral stone in the coffee grinder to get mineral dust. Look at the coffee grinder. Fill the dust in an empty jar. If you don't have an empty glass in your inventory, you'll find one on the cupboard right to the front door where you came into the room. Go back to the prayer room. Drop the glass filled with mineral dust onto the floor to break it. Walk through the room to the altar and look at all 6 paintings. Take the segmented ring out of the altar dresser. This is a place of humility and self-abandonment. Scourging tools are located in the cupboard and on the wall next to the altar cabinet. The simple benches are all directed at the altar, overlooked by an idealized image of divine salvation. Around the room, depictions of brutal scourges remind the monks of their tasks. Go across the courtyard back to the kitchen. Look at the sink where you notice the piece of water in the drain. Click on the sink to see that the piece is unreachable. Talk to Barbara about the drain to get a hint. Go through the door into the bath. Look at the glass window. The scene of a small boat depicted in the glass window on a stormy sea should once again keep the monks in mind of how small and weak the human being is towards the divine. 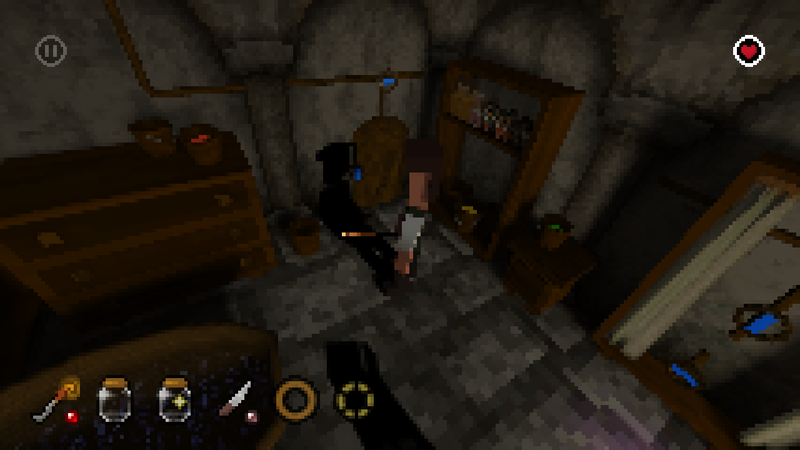 Because this space is very tight, Barbara follows the player only along the outer edge of the room. In addition to spiders, the Fog Wanderer has summoned three frogs to attack the player when he comes close. In contrast to the player, Barbara can also attack the frogs when carrying a weapon with enough self-esteem. First go to the toilet door to the right of the glass window. Read the Wellness book located on the toilet and remember the mixing ratios. The frog in the outer tub will not attack if you walk as close as possible along the wall. Walk back towards the entrance, but turn left to the boiler. Consider all four buckets as well as the objects on the shelf. Drop an empty jar (can be found in kitchen) several times on one of the buckets to mix a bath additive. Use the combination 1 green + 1 yellow + 2 red and then drop the mixture into a tub. The frog turns into an ally and may even kill some spiders before it disappears itself. That Chris is hurt by the mixture against ghosts can be understood as a reference to the spirit world in which we are currently. If not already there, go back to the boiler between the buckets and click on it. Click the wheel on the lower left side to empty the boiler. Click on the boiler to see that the pipes amplify noise. Click on the boiler to call and talk about all topics. The pipes, which run water into the central well shaft in the inner courtyard plus the echoes in the empty water pipes, provide an indication of where Valerian is located. Now switch the pipelines so that they run water into the kitchen to flood the piece of timber from the drain. The blue line on each wheel shows the direction of the flow. Turn the wheel over the boiler horizontally. Walk to the closet with the towels. Look at it and push the cloths aside. The upper valve is the inflow to the sink. Open it by turning it vertically. The lower valve is the drain of the basin that comes back from the kitchen. Close it by turning it to horizontal. This is the only way to keep water in the sink later. Walk around the tubs to look at the abandoned beds. Fight any other spiders and run to the end of space. Consider Valerian's bed and take the little ring under the pillow. Since the left valve is already on the run , only change the right to vertical alignment. Click on the sink to fill it with water. Get the middle ring. The basin, which is filled with water, also serves as a healing well where the energy of life can be replenished. You can talk to Barbara about all the rings. Combine the large and the middle ring. Combine the composite part with the small ring. Combine the segmented ring with the created tube to obtain the tower figure. Walk across the courtyard through the prayer room to the library. If it is not yet clear what the tower is, Barbara can give a clue to the chess game when the tower is shown to her. Place the tower on the chess board to beat the demon. Take the book off the table and read it. Show the book to Barbara. Walk backwards and find the empty/black spot on the bookshelf. Put the dummy books in the open place on the shelf to unlock the secret passage. Walk through the secret passage and go through the door into the tower. Click on the door to unlock the way into the courtyard. This is not required, but will provide a shortcut later. When entering bell tower from the library, continue downwards to see a different camera angle of the room. Climb up the steps into the tower. Look out of the windows. You have already seen the first window from outside when you were in the courtyard. Accordingly, you now look down into the courtyard. The back window gives a new view into a bay and forecasts the scenery of Episode 3. Pull the bell rope to give the sign that Valerian is waiting for. The monk appears and finally meets Barbara. The other events depend on whether Barbara could emancipate during the game. In any case, she leaves the monastery through the main exit, while Valerian locks himself into praying room. Exit the monastery through the main gate and walk down the way to the village. Barbara has already disappeared, the bells begin to ring. Go to the prayer stone. Catch the butterfly in a jar. If you caught Harry's butterfly at the beginning of the episode, use that butterfly glass again to collect all butterflies in the same jar. Walk back to the bell tower top. The game can also be continue without capturing the butterfly, as they will become be an optional help later. The violet shining around Barbara's corpse reveals that she was killed by the Fog Wanderer. In bell tower, Valerian was ringing the bell to give a warning signal about the presence of the Wanderer. Unfortunately this is exactly how he attracts the attention of the Wanderer. In the original screenplay the characters already meet the Fog Wanderer and get involved in a fight now. But at the end of the production of Episode 2 a more open end seemed much more exciting and attractive in order to increase the tension for the next episodes. Catch the butterfly in the house of the settlers with the jar. Catch the butterfly on the Holy Stone with the jar. Find clues on why you came to this place. Read the letter in spider house in the village. Show Barbara the business card. Read all the books in episode 2. Read the motivation book on the bench in front of the burning house in the village. Read the chess book in the library. Read the medicine book in the library. Read the wellness book on the toilet of the monastery bath. Look at all the pictures in the monastery. Look at all 6 images in prayer room. Look at the glass window in bath room. Banish 30 Evocations of the Wanderer. Kill 30 violet shining creatures. This includes all types of creatures and all types of kill. Find 4 ways to banish the Wanderer's evocations without direct combat. Kill the spider in Spider House by cutting the crate rope. Banish the bull by showing the business card. Kill the Spiders in praying room with mineral dust. Kill a frog with bath additive.